Titian’s visual poetry – or how to repaint an Emperor. At the Royal Academy at the moment there is a magnificent exhibition of King Charles the First’s art collection. The undisputed star here is Anthony Van Dyck. As esteemed as he is, on the evidence of this show I would say that he is still underrated. The 3 massive equestrian portraits in the same room, brought together for the first time ever, are all knockouts and alone are worth the price of admission. Seeing all these Van Dyck’s together brought home to me how well Van Dyck had learned the compositional lessons of Titian. It is this that I’d like to talk about, because there is a painting in this show that offers an unparalleled insight into Titian’s decision making process. On the evidence of this exhibition, Charles I owned at least a couple of Titians. One of these, his 1533 portrait of the Holy Roman Emperor Charles V, is unusually revealing about Titian’s thought process because it is a copy, or, more accurately, a reinterpretation of another man’s portrait. The new version pleased the emperor so much that he immediately made Titian his official portraitist. By comparing it with the earlier one by Jakob Seisenegger, we get to see Titian’s original subject matter before he sets to work with his unrivalled ability to create visual harmony. It provides a unique insight, as we get to see exactly what changes he has made, and infer why he made them. Most obvious when comparing the two is that Titian has simplified the work. He has darkened passages and made it more atmospheric; passages completely and precisely delineated in the Seisenegger now drift off into shadow. On a straightforwardly narrative level, Titian has made Charles taller, and he now completely dominates the space of the canvas. Instead of droopy eyelids he has a more intense, intelligent gaze. Flattery of this sort is to be expected. Although a brilliant ruler, Charles V was not the prettiest; he suffered from his Hapsburg family’s enormous lower jaw, to the point where he could not close his mouth. But flattery is not why this is the better picture. In terms of colour, Titian has simplified the whole work into a harmony of copper and silvery grey, and has massively downgraded the bright green curtain. The sliver of curtain that remains is still green but has been bronzed with the addition of the (overall) brown. As basic colour theory tells us, cool colours recede and warm colours come forward, so Titian makes sure that the brightest warm colours are Charles’ exposed skin, his hands and face. He is very careful not to let anything outshine them. In comparison Seissenegger has made some marble tiles on the floor the hottest element. The effect is to drain the blood from Charles’ flesh. But the most powerful tool in Titian’s picture construction armoury is his control of light and dark. In the top part of Titian’s picture there is nothing remotely as bright as Charles’ face, whereas in the Seissenegger Charles’ visage competes for attention with a big white feather, several bright folds of curtain, and a lit section of wall. Your eye is a sucker for powerful tonal contrasts and tends to be drawn to the places where those contrasts are highest – where the lightest lights meet the darkest darks. Titian was supremely aware of this and took immense care in fashioning the borderlines between light and dark into clear, pleasing shapes. Lines are either made very straight or smoothed into unfussy curves. Just one example – compare the two faces, specifically the line along the top where the light of the forehead meets the dark of the cap and hairline. Seisenegger’s bumpy ride from left to right is transformed by Titian into a clean arc. Titian tidies up like this all the time, which makes for a more pleasurable viewing experience. But creating clear shapes is only half the story. Titian makes sure that these shapes are placed in clear relationships with one another – the edges of shapes either rhyme with each other (parallel), or flow into each other (align). You may not notice these relationships but, because they are there, you feel a strange sense of “rightness” to the picture. An obvious straight line, in both pictures, is the edge of Charles’ silver coat on the (viewers’) left. Titian decides to make full structural use of it by extending the straight line all the way to the top of the picture. He invents a highlight in the curtain above Charles’ shoulder that aligns with the coat edge; but what to do about the arm that juts out in between? To continue the line he shades the part of the sleeve just above the coat edge, and then, when the line hits the puffy shoulder, he cleverly darkens the pattern on the material, which allows the straight line of the cloak to continue through this silver balloon and on into the curtain. I love the ingenious ways Titian deals with awkward, messy reality in an effort to structure his pictures. It would be easier for him if he were an abstract painter. Once you realise what he is doing it becomes a delight to see how he does it. This line rhymes with (is parallel to) the straight line which flows up from the top of the thigh and along the edge the black fur coat. Note how Titian moves this fur edge further across Charles’ torso so it ends under his chin, pointing straight to his face. These lines also rhyme with other long straight lines – the outside edge of Charles’ rear lower leg, as well as the dog’s front leg. The other shoulder is shaded right down so that only the shape of the arm glows. The angle of this arm, resting on the dog, has been widened so that it is now symmetrical with the other arm. The inner edge of the arm is in direct alignment with the dog’s rear leg, and now rhymes with the dog’s chest and the inner edge of the other arm and shoulder (now much straightened). The outer edge of the arm continues down the body of the cleverly shaded dog, all the way down the vertical leg and into its toes. Charles’ doublet (his close-fitting padded jacket) has been shaded right down. Seisenegger paints the doublet as a bright, tan, tilted rectangle; Titian transforms it into a triangle, with Charles’ head at its apex. 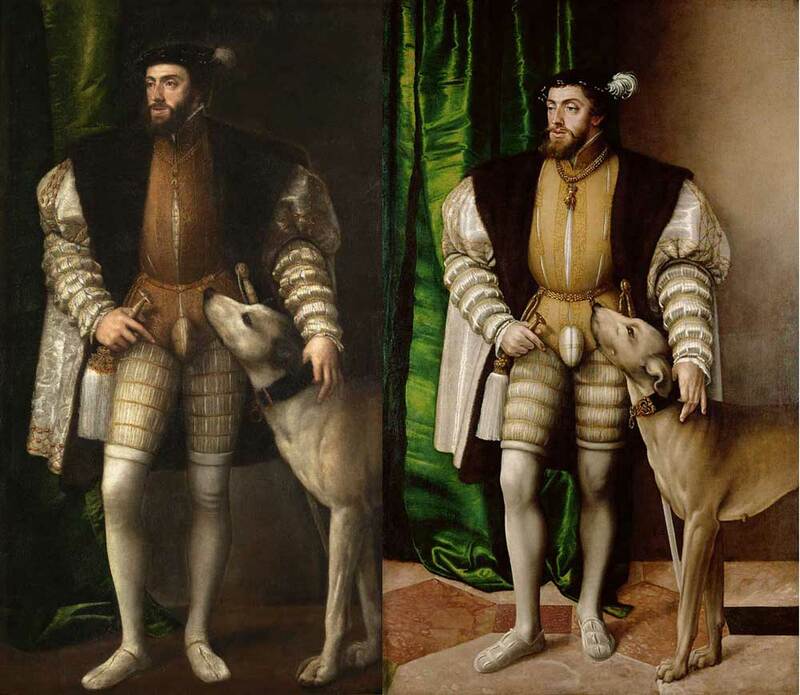 Note how Titian lines up, in a way Seisenegger doesn’t quite manage, the slivers of exposed shirt on the torso with the codpiece (no longer a large conch but a white line), and aligns that stripe with the inside edge of Charles’ rear leg. The whole line points straight toward his face. Titian is a master at turning bitty unrelated elements into long structural elements. Part of the point of any portrait of a monarch is to project power. In the Titian, a lot of the structural elements point towards Charles’ face, as if it was at the apex of a pyramid. In fairness, Seisenegger seems to attempt this too. Sword, dog, man’s leg all point towards Charles’ face, but there are too many competing elements that diffuse this. Titian is much clearer and more ruthless. You would think that Titian would be tempted to keep the straight edge of the sword blade but he obscures it to the point of invisibility. I think he does this for two reasons. One, as we see in the Seisenegger, it leaves a small and pointlessly distracting triangle of dark between it and the dog’s leg, and two, it interferes with a beautiful harmony Titian has created at the bottom of the picture. Titian has reconfigured the legs into a particularly beautiful passage. He aligns the feet along the bottom edge. The floor has been darkened to near invisibility, as has the much shrunken curtain, so that virtually the only elements we see are the shining, silvery legs of man and dog. The thigh of Charles’ load-bearing leg has been darkened considerably, giving more prominence to the beautiful mirroring of the angled shapes of Charles’ bent leg with the chest and leg of the dog. The pinching of shadow at the man’s knees aligns with the angle at which the dog’s chest meets its leg. Titian helps this along by painting 3 curved creases on Charles’ rear knee, which, not coincidentally, echo the multiple curves above it on Charles’ thigh. There are so many lovely touches here. Of the four legs the two inner ones are parallel, the two outer ones parallel. Look at the man’s and dog’s facing feet – every change in direction along these facing contours mirrors each other beautifully. But most importantly Titian cuts off a good chunk of the right of the canvas. No longer does the line of the dogs stomach pointlessly lead out of the picture. Gone also is the light patch on the wall, which takes the focus away from Charles for no good reason. Arising from the this now new bottom corner both legs of the dog flow straight up into the glowing arm of Charles above. Indeed, Titian must have looked in disbelief at the black band Seisenegger painted on the floor. Titian would never put in a powerful tonal contrast like that unless it served some structural purpose. These are just some of the big structural decisions. But Titian pays just as much attention to harmonising elements on the micro level. The whole waist section is full of disparate elements which Titian attempts to put into a harmonious relationship. He changes the dog’s face by squaring it off into a whitened block (compare where nose meets face in the two paintings). He raises the hand and handle to the same level of the dog’s face, thereby creating a kind of mirroring along the vertical axis line of the codpiece. All the angles and straight lines here either rhyme with or mirror each other– sword with the cords on the other side of hips, the shaft and top of the handle that emerges from the hand with the squared off contours of the dog’s head and neck. He obscures the distracting shape of the dog’s ears by shading the back of the it’s head into a flowing curve. This dark band now rhymes with the belt and collar above and below it. Titian’s harmonising zeal is everywhere apparent. Compare the yellow horizontal straps along Charles’ thighs in both paintings. Titian basically lines them up so that those on one leg flow easily into those on the other. The hanging cords of the belt are made into less distracting and prominent entities by being painted the same coppery brown as the doublet (his close-fitting padded jacket), as has the now-shrunken necklace above. In short, Titian keeps the detail but tries to find a way that they no longer draw bitty attention to themselves. There are too many harmonic details to list; Titian’s unflinching attention to creating relationships becomes more obvious the more you look. It is something he clearly enjoyed doing and was perhaps more sensitive to these things than any other painter. He ties elements together like words in a poem. His best paintings (and as much as I like it, I don’t think this is one of them) are miracles of this.